Let Woody and the gang add a little fun to your party! 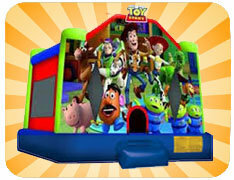 Our Disney Toy Story themed bounce house features fun graphics from the movie along with a large jumping surface. Our large bounce houses feature a 15 foot by 15 foot jumping surface which is larger than the jumping surface found in our regular bounce houses. This bounce house is 15 feet wide by 15 feet deep and is 13 feet high. One attended is required to monitor play while children are playing. This attendant can be someone that you provide, or Parties Inc. can provide an attendant at an additional cost.